Not to be confused with Thiruvidaimarudur Taluk. Thiruvidaimarudur (also spelt as Thiruvidaimaradur or Tiruvidaimarudur) is a panchayat town in Thanjavur district, in the Indian state of Tamil Nadu.It is the suburban region of Business city of Kumbakonam.The town is famous world over for its Mahalingeshwarar Temple, a Hindu shrine for Lord Shiva. 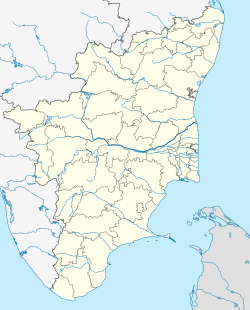 Tiruvidaimarudur is located at 10°59′N 79°28′E﻿ / ﻿10.98°N 79.47°E﻿ / 10.98; 79.47. It has an average elevation of 20 m (66 ft). The 2001 Indian census recorded Thiruvidaimarudur as having a population of 13,758. Males and females each constituted 50% of the population. Thiruvidaimarudur has an average literacy rate of 74%, higher than the national average of 59.5%: male literacy is 80%, and female literacy is 68%. 11% of the town's population is under 6 years of age. Thiruvidaimarudur assembly constituency is part of Mayiladuturai (Lok Sabha constituency). About 9 km (5.6 mi) north-east of the Temple City Kumbakonam, this is one of the Taluk H.Q. in the Tanjore District. Tiruvidaimarudur has a rich heritage of fertility and people have habit of harvesting thrice in a year. Sometimes the River Cauvery makes a fourth harvest possible..
Tiruvidaimarudur has a Siva Temple namely Mahalingha Swamy with the Goddess Brahath Sundara Gujambal(In Tamil, it is Perunala Mamulai Ammai). Shiva is worshiped as Mahalingeswaraswamy, and is represented by the lingam. This lingam, known as Jothimayalingam is “believed to be the focal point for the seven consorts of Shiva.” The Nandhi in the Temple is one of the largest in the district, of course it is not made of a single stone, that is why it is not weighted more than the Brahdeshwara Temple at Tanjore though it is bigger in size than that. There is a separate Sannathi for "Moogambigai" with Maha Meru. A large number of devotees visit this temple for relief from Bramha hatya Dosha. Two temple festivals are being celebrated for 10 days - "Thai Poosam" In January- February and another one, Thirukkalyana Uthsavam (Vasantha utsavam) in Vaigasi (May). 63 Nayanmar Ula and Aruthra Darshan( like in Chidambaram) are the other two important temple festivals. There are 27 star lingas, the prince "Ammani Ammal" Vigragam and Chitra prakaram(enclosed precincts of a temple) which is full of painting. There are several charitable trusts, one of them being "Pachhiyappa Mudhaliyar ArakattaLai". Tiruvidaimarudur is the birthplace of the Hindu Saint Pattinathar - in the medieval period - whose lyrics are renowned for realizing self in Hindu mythology. This temple also known for giving redemption to King Varaguna Pandiya from his "Brahmahati DhOsham", and there is a belief still prevalent that any kind of evil spirit will leave when you touch the place. It is a popular belief that Lord Mahalingam cures the lunatic when they circum-ambulate the temple. When his (Pattinathar) sister, embarrassed to see him wander like a beggar, wanted to eliminate him by placing poison inside sweetmeats, Pattinaththar threw the sweetmeats on her house roof saying "தன்வினை தன்னைச்சுடும்; ஓட்டப்பம் வீட்டைச்சுடும்" and instantly the house roof caught fire and in the flames that engulfed the premises, the entire house was reduced to ashes. temples in thiruvidaimaruthur It is also the birthplace of the Carnatic music flautist T. R. Mahalingam. Suggested Correction: Tiruvenkaadu is the birthplace of Swami Pattinathar, as attested to by his given birthname "Tiruvenkaadar". The name Pattinathar was an honorific that came about through common usage of the way people referred to him. Since the city was known as Kaveri Poom-Pattinam, the sage was referred to as "Pattinathar", the One who hails from the City. This is generally because it is considered impolite to address or refer to a revered person by name. Tiruvidaimaruthur is the place to which he was guided in order to meet his Guru, who, at the behest of Lord Shiva Himself, initiated him into the intricacies of Saivite worship. Om Namah Sivaya. ^ Sowmya, S (29 June 2003). "The Linga - An attraction at Thiruvidaimarudur". ChennaiOnline. Chennai Interactive Business Services. Archived from the original on 2 February 2008. Retrieved 4 October 2007. ^ "List of Parliamentary and Assembly Constituencies" (PDF). Tamil Nadu. Election Commission of India. Archived from the original (PDF) on 4 March 2009. Retrieved 12 October 2008. ^ Thirumurugan, Varatharajan. "Mahalingeswarar Temple, Thiruvidaimarudur". Tamil Nadu Temples. Retrieved 13 December 2018. ^ Michell, George (1995). Architecture and art of southern India: Vijayanagara and the successor states, Volume 1. Cambridge University Press. ISBN 0-521-44110-2.